Shorts are the registered trademark of the summer. It is the first thing to search for in the closet once the temperatures soar. But there is always a way to dress them up with an elegant and floaty solution such as a maxi shirt that catches the wind in its drapes. Exuding casual city vibe, the combination of red linen shorts with a white floaty semitransparent shirt is both original and edgy, with a touch of classic elegance. The beautiful contrast between the white and the red is refreshing and inspiring. The shirt displays fantastic flow of the material with irresistible feeling of freedom, while the shorts are comfortable, flexible and suitable for summer. Add a bold statement piece to the ensemble such as an oversize leather jewel and you are set. Casually sophisticated, with a touch of decadence, here you go, effortlessly gliding through the heat, with the shirt flapping in the occasional breeze. 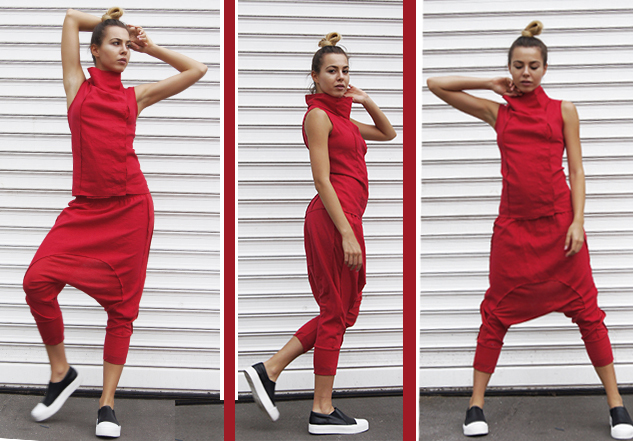 Or if you are more inclined to bet on vests, go for linen set in beautiful red, consisting of a vest and drop crotch pants, very body flattering and absolutely unique. With this set you can rock a a party, go for a brisk walk, ride a bicycle, stretch on the grass or even make your way through a regular office day. Combine with extravagant sneakers and go show it off.